Cătălina Dănillă, Steve Mills, Pavel Mirea, Amelia Pannett and Laurens Thissen’s transformation of clay through the hands of the village youth and then through the pyrotechnology of firing transformed the pliable into the rigid, the natural into the cultural, and the children’s kneadings and coilings into museum display items. 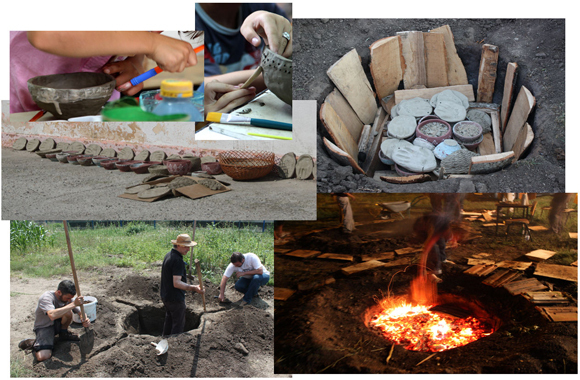 The primary process which has made archaeological culture registration possible (making ceramic vessels) – itself a transformation of material – was exploited to create modern villager’s contributions to the institutional display of their village’s history. 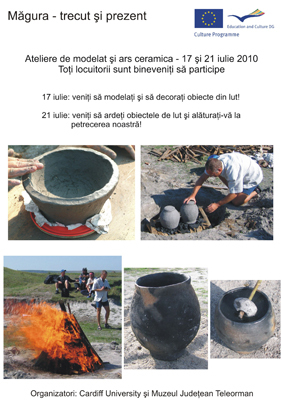 Based on prehistoric techniques, the workshops on pottery making, decorating and firing took place in the Şcoala de Arte şi Meserii Măgura in July 2010 and the objects produced contributed to the Măgura Trecut şi Prezent expoziţie at the Muzeul Judeţean Teleorman.